Manufacturer of motorcycles (1901-1939) and cars (1899-1905) of Pountney Street, Wolverhampton. 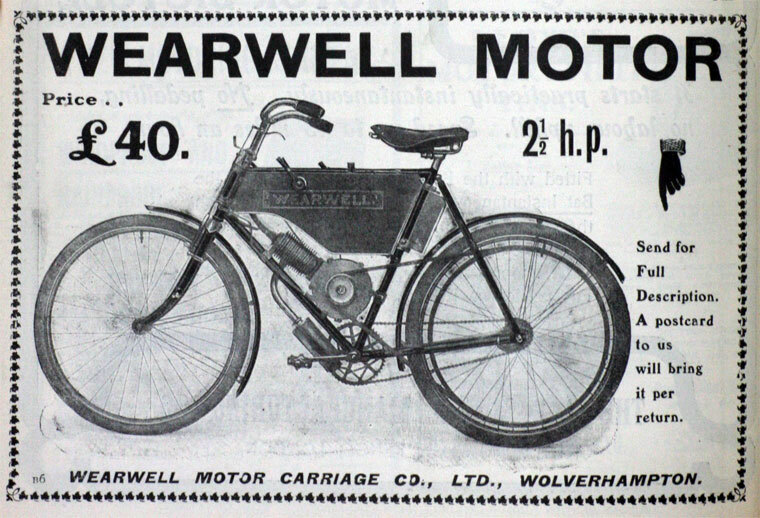 1896 The Wearwell Cycle Co was registered on 27 May, to take over the business of William Clarke. 1899 William Clarke had the idea of producing powered vehicles. 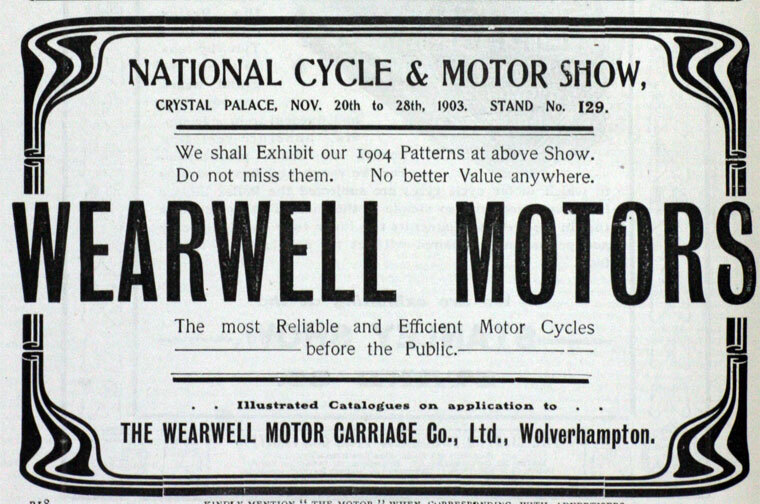 He formed the Wearwell Motor Carriage Co, and opened new premises in Pountney Street. They produced a 4 wheeled, powered vehicle which had two Butler, 2.25hp engines, mounted side by side. It was not generally liked. William saw the early Stevens machines and realised that this was the way forward. The company already had links with the Stevens Motor Manufacturing Co, who supplied spokes and screws for the bicycles. An agreement was entered with Stevens and a contract drawn-up. Stevens, agreed to supply a minimum number of engines each week, which were fitted to heavy duty bicycles. 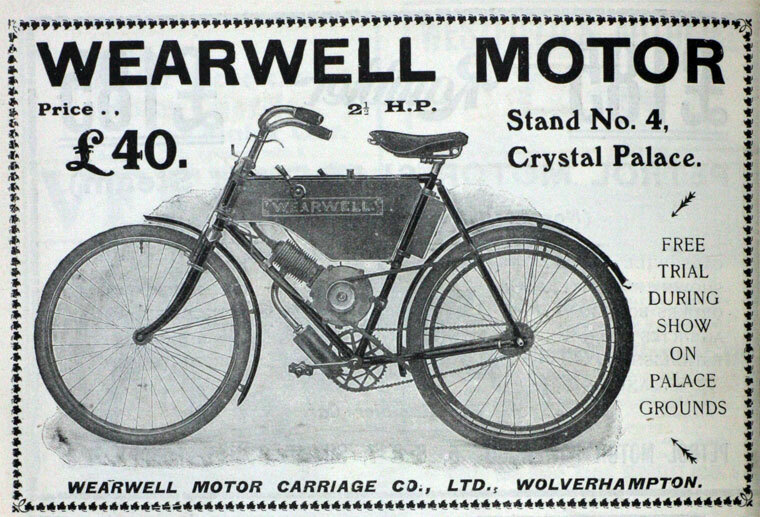 The new motorcycles were sold using the Wearwell-Stevens name. 1901 Having already been involved with the production of cycle components, bicycles and even cars, the company produced its first motorcycle. It was a true primitive, based on a heavy-duty bicycle fitted with a 2.5hp Stevens engine mounted inclined above the down-tube and with direct-belt drive. The machine sold well. 1901 The first machine appeared in the spring of that year. It was fitted with a 2.5hp, air cooled, four-stroke Stevens engine, with automatic inlet valve, and mechanically operated side exhaust valve. The engine was mounted above the front down tube, had accumulator ignition, a surface carburettor, and a twisted leather belt drive to the back wheel. It sold for 42 guineas. The machine was very popular and was shown at the 1902 National Cycle Show at Crystal Palace. A number of improvements were made, including a choice of surface or spray carburettor. Demonstrations were given at the exhibition, the price was reduced to £40, and orders poured in. 1901 December. Details of the Parker steam car designed by Thomas Hugh Parker. 1903 Further changes were made that year. The rear wheel was now driven by a Lincona Vee belt, and the surface carburettors were discontinued in favour of the spray type. 1903 The same year saw the introduction of the Motette powered tricycle. It was a modified version of the 2.5hp bicycle. The front wheel was replaced with a two wheeled axle, onto which an upholstered wicker seat was attached. The machine sold for 53 guineas (£55.65), and a conversion for two-wheeled machines was available for £16.5s.0d. (£16.25). These products proved to be unpopular. 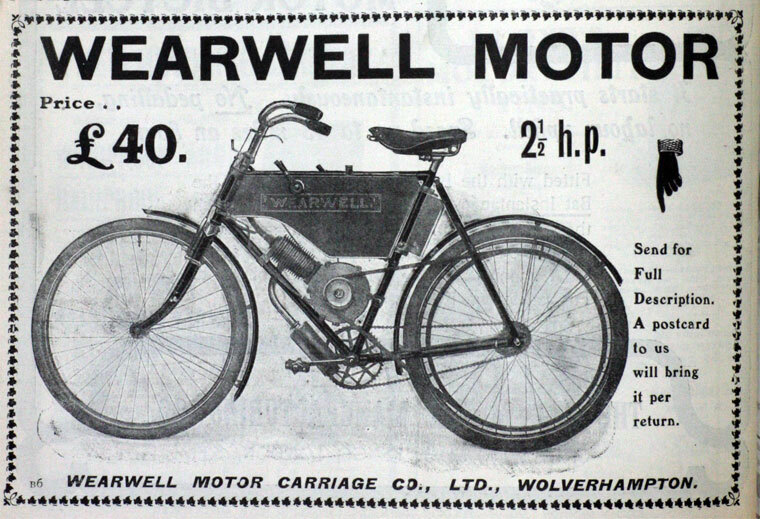 1903 It was joined by the Wearwell Motette forecar, which had its two front wheels and wicker passenger-seat fitted in place of the motorcycle front wheel. At the late crystal Palace show, the 2.5hp model was joined by one with a 3.25hp engine mounted vertically in the frame. It was of sturdy construction and with braced forks, but it still had belt drive. The Motette was revised to that layout, but its 3.5hp Stevens engine was water-cooled and drove a Bowden rear hub that incorporated a clutch by chain. 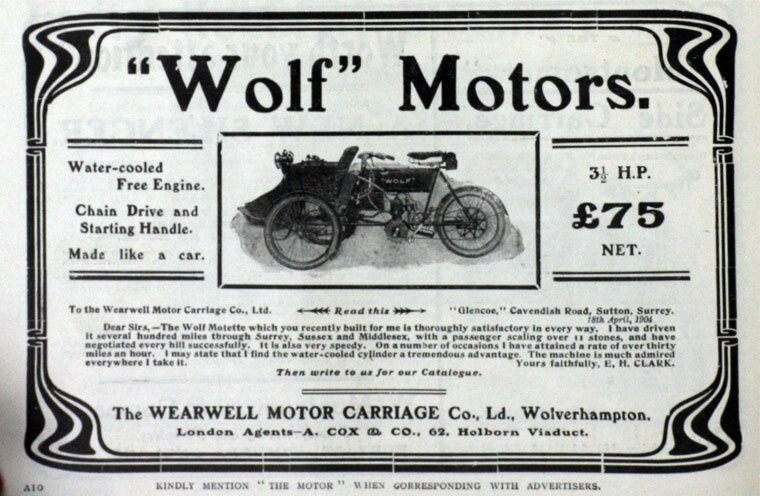 1904 The name of the motorcycles was changed to Wolf. 1905 A redesigned and sturdier model was launched using the Wolf name. It was fitted with a 3.25hp Stevens engine, which was vertically mounted near the bottom bracket. By 1906 there were more than a dozen models, and a wide range of engines to choose from. Prices ranged from 37 to 42 guineas (£38.85 to £44.10). Lightweight, heavy duty, and commercial versions of the powered tricycles were also produced. The lightweight version was like the original Motette except that it included a 4.5hp, or 5hp, water cooled, vertical twin engine. It had a two-speed gearbox, a leather saddle, and sold for 75 guineas (£78.75). The heavy duty version was more like a car. It had body panels, and was fitted with a steering wheel. It had a 7hp or 8 hp, water cooled, vertical twin engine, a three-speed gearbox and clutch. The cheapest version sold for 100 guineas (£105). The cheapest machine was the Wolf featherweight, which was similar to the earlier powered bicycles and sold for 19 guineas (£19.95). Stevens also started to supply the company with frames, and the company sold the Stevens 1.5hp motor set, complete with all parts for £14. The Stevens brothers also started to ride Wolf machines in reliability trials and speed events with great success. The heavy duty vehicle, the Wolf Carette, was more like a car. It had body panels, and was fitted with a steering wheel. 1909 Disaster struck when it was discovered that the Company Secretary, Mr. King, had been using the company's money to gamble at pool in a local public house. A large sum of money had disappeared, which led to the company going into liquidation. Mr. King tried to commit suicide, but William Clarke did not bring any criminal charges against him, because he discovered that one of his brothers was also involved. 1910 the Wolf machines looked more like conventional motorcycles. 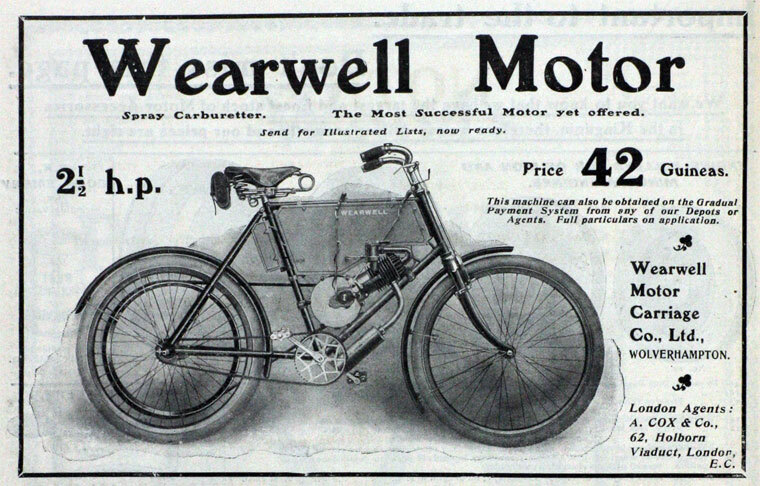 1911 After the liquidation, William still wanted to continue producing Wearwell bicycles and so he purchased the ailing Wulfruna Cycles from John Barratt. He attempted to revitalise the business and reintroduced the Wearwell and Wolf names at new premises in Brickkiln Street. The production of cheap machines continued, as a 2.5h.p. 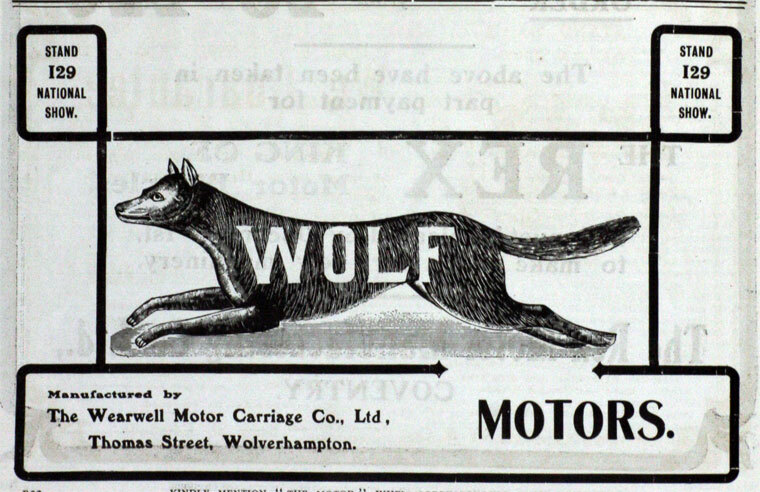 Wolf was on sale in 1914 for just 22 guineas (£23.10). 1920s A range of Wulfruna machines was available until the early 1920s, after which the company concentrated on its Wolf trademark. 1928 The brothers Theo and G. A. Waine took over the Wearwell Cycle Co Ltd from the liquidators of the Wulfruna Engineering Co Ltd. The Waine Family were lock makers in Willenhall, and used to supply large numbers of locks to the far east. They also used to make steel heel tips for shoes, and supplied them to the army in the first world war. They used to import their steel from Belgium, and in those days it only cost £4 a ton. When Theo inspected the Brickkiln Street works, he decided that it was not suitable for their purpose. The family owned the New Griffin Works in Colliery Road, and so the cycle business was moved there. Part of the works was occupied by the cycle company, the remainder was occupied by the family's other business, Vulcan Engineering Co. Vulcan was a general engineering company. 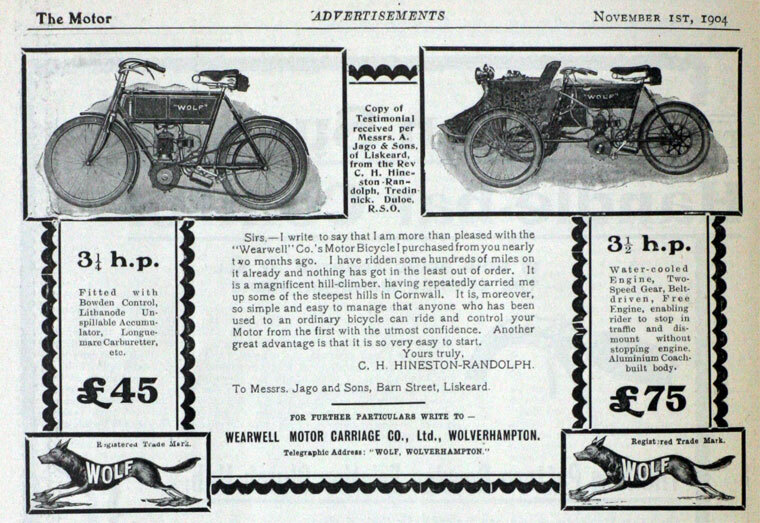 1931 The factory expanded; the production of Wolf motor cycles commenced and a trade stand was taken at Olympia. Mr. H. V. Waine, a keen motor cyclist, was responsible for the design and production of both motor cycles and cycles, while Mr. T. A. Waine was responsible for sales. The first machines used Villiers engines. The Cub, which had a 98c.c. engine sold for only £15.15s.0d. (£15.75) The Wolf Silver Super Sports was powered by a 196c.c. Villiers engine. This sold for only £34. Wolf motorcycles continued in production until the outbreak of World War II. After the war the company decided to concentrate solely on the manufacture of pedal bicycles, and so motorcycles were no longer produced. This page was last edited on 26 March 2018, at 03:09.